Owned and operated by Jodie Curran, winner of the prestigious RateMyAgent ‘Agent of the Year’ in both 2017 and 2018 across the entire Sunshine Coast beating 1335 other agents to number 1. Jodie is also a 2018 QLD State Finalist for ‘Agent of the Year’, coming 6th out of over 12,000 agents. In any industry — particularly the competitive arena of real estate — client feedback is everything … and that’s what makes agent4573 and excelRENT unique and what makes us most proud. We do everything in our power to go the extra mile, ensuring our clients get a highly personalised, boutique real estate experience with the best possible outcome. Our model works and the results speak for themselves and we never forget we’re working for YOU. So if you are looking for the best real estate agent on the Sunshine Coast give us a call and discover the agent4573 and excelRENT difference. Jodie has always been very professional and at the same time very likeable…. The Sunshine Coast is a regional area, the property market is slower than in capital cities, there is less competition and days on market can be longer. 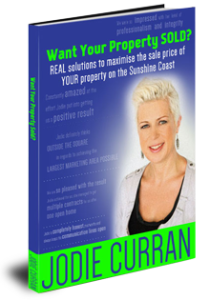 In this book I will outline the critical steps you should take to sell your property for more on the Sunshine Coast. The advice I share is tried and true. Applying the hints and tips set out within these pages has been proven to work time and time again.